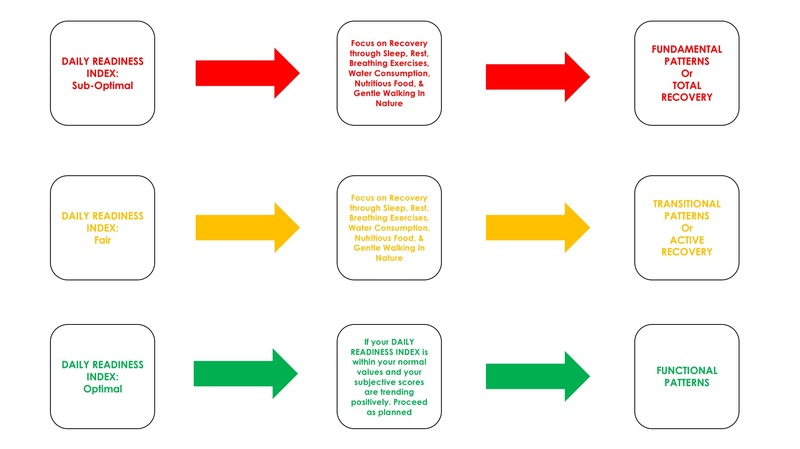 The Pillars of long lasting change are: Mindset, Recovery, Nutrition/Hydration, and Movement. Click here to learn about the UpRight Movement Principles. Sub-Optimal: Fundamental: Breathing, Gripping, Head-Eye Tracking, Reaching, Leg Raising, Supine, Rolling, Prone, Hip Flexion/Extension, Short Foot Posture. 0-40% and or 1-20 min. training session duration. Fair: Transitional: Quadruped, Rotary Stability, Trunk Stability, Crawling, Half Kneeling, Full Kneeling. 40-60% and or 20-40 min. training session duration. Optimal: Functional: Lunging, Stepping, Squatting, Carrying, Gait, Skipping, Running, Deceleration, Acceleration, Jumping, and Hopping. 60-80% and or 40-60 min. training session duration. Focus on keeping your totals as close to the green as possible. If you experience two days in a row where your Daily Readiness Index decreases take at least one day of TOTAL rest. 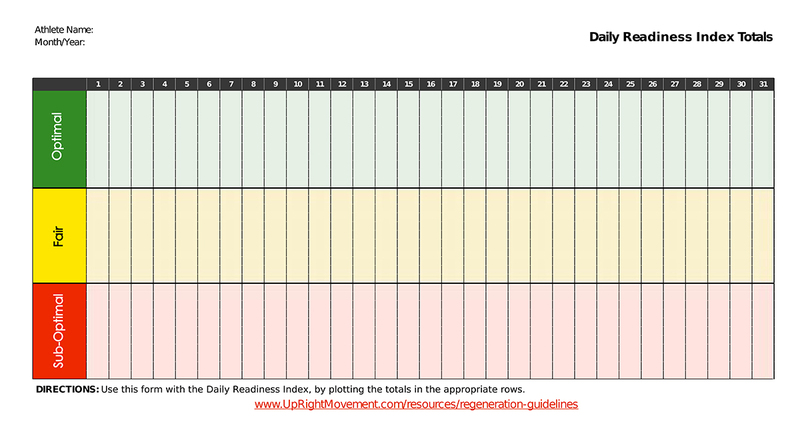 If your Daily Readiness Index keeps decreasing, take a step back and correct whatever needs to be corrected. It may be: mindset, self-time, water consumption, sleep quantity, sleep quality, food quality or type, meal timing, movement (too little or too much). Keep your Daily Readiness Index as high as possible and soon you will be feeling consistently great. For further assistance see UpRight Movement’s Regeneration Guidelines.